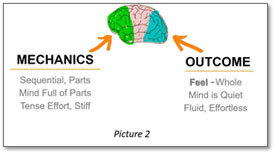 Mechanics aren’t bad, they just use a part of the brain that creates tense, stiff effort. If you’re looking for more fluid looking players, I might have an answer for you. We’ve all been raised to hold mechanics on a pedestal. Drilling on them every practice and taking pride in how “mechanically sound” our players are. And trust me, it’s great your players have solid mechanics – but it’s greater if they can actually use those mechanics in a game, under pressure to beat their opponent. After all, isn’t that their point?! If you’ve thought your players looked “too stiff”, were “too robotic”, or didn’t look “fluid”. If your team has ever told you they feel “tense” or their minds are filled with too much stuff, then you might be surprised to learn the culprit just might be mechanics. Here’s how it works. Our brains are pretty amazing when it comes to how we process instruction. The front part of the brain is the analytics section, while the back part is more instinctual. When we teach our players mechanics, we’re teaching parts and pieces. The front part of our player’s brains are working full-blast trying to move the right body part at the right speed at just the right time. But in spite of what we’ve been taught to believe over the years, there are some downsides to focusing too much on mechanics. The 3 biggest downsides are: 1. They cause our players to become Tense, 2. Our players play Stiff and Robotic, and 3. Their Minds become Hyper Critical. When we shift our teaching gears from emphasizing Mechanics to focusing on the Outcome, then our players shift to another part of their brain – the back portion. Focusing on things like “hit the back of the ball”, “nail your outside target”, “get the ball out of your glove faster” – those kinds of outcome-based goals quiet your players’ minds and they start looking more fluid and effortless. 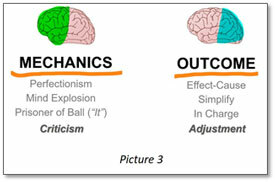 Shifting our teaching to more outcome-based results forces our players to use a more instinct-based back portion of their brain. A closer look at Pictures (2) and (3) will show you just how differently these two parts of the brain impact our players. As the vessels of information on the ballfield, we can help our players become “smoother” by switching up our teaching methods and not always tearing things into pieces and focusing only on mechanics, but helping our players put things together and focusing on the outcome. Another benefit of mixing in Outcome-based instruction is it helps your players focus on making adjustments instead of criticizing and harshly judging themselves. I’m not saying you give up ever teaching mechanics, but I am saying we shuold all try to mix in more whole-based outcome-type instruction to let our players literally shift their minds to a more game-like mind frame that’s based on results versus mechanical pieces. We Offer Fastpitch Group Lessons Too!